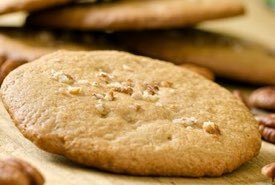 You'll love this special raisin filled sugar cookie recipe. This old family recipe was a favorite of Grandma Catharine Louise McIlmoyle, and it was handed down and treasured by her family. These filled sugar cookies taste amazing, and now the special recipe is yours. 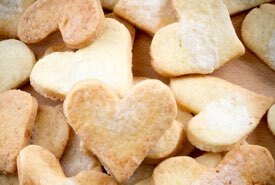 "I got a copy of this old time raisin filled sugar cookie recipe from my Aunt Berenice," writes Maureen Stephan. "She has a copy of the recipe that was written out by hand by my Grandma McIlmoyle. 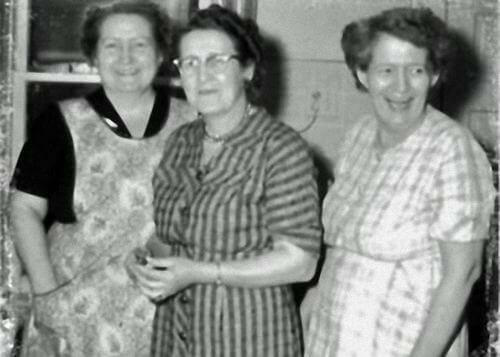 "Above is a picture of Grandma, Catharine Louise McIlmoyle, with two of her sisters. My Grandma is seen on the far right of the picture." Maureen, thank you so much for sharing your grandmother's wonderful recipe. I'm sure that many of my visitors will enjoy having it. Maureen and I both have Grandma McIlmoyles. Maureen read about my own Grandma McIlmoyle on this website, and it turns out that she and I share a common ancestor, Hugh McIlmoyle (1749-1838), my great-great-great grandfather from whom she is descended also. It's truly a small world. Thank you! 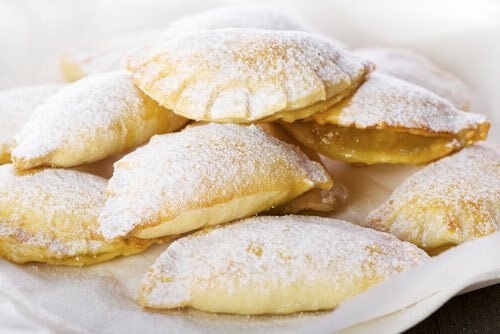 I have been trying to find this raisin filled sugar cookie recipe for a long time now. My mother used to make these sugar cookies at Christmas time, but she would divide the dough in half and color one part red and the other part green and use Christmas cookie cutters like Santa, Stars, and Reindeers. I can't wait to make them myself as it has been years since I've had them. Easier to make if you put the dough in a bowl and cover it overnight. Cookies dry out quickly. Let them cool on wax paper and cover or put into cookie jar. Combine above with flour mixture. Dough will be very stiff. Chill for two hours for easy handling. Make into walnut-sized balls, press down and flatten out, and sprinkle with sugar on a lightly greased cookie sheet. Bake at 400°F on bottom oven rack until they rise (approx. 4 to 6 minutes). Turn sheet around and put on top oven rack until they flatten and turn light brown (approx. 4 to 6 minutes). Remove from oven. Put on waxed paper and sprinkle with sugar. Cool. Cook for five minutes. Cool. Roll sugar cookie dough (see above) out on floured/sugared surface and cut in circles (Mother used the lip of a glass to cut the circles). Put filling into center of cut circle of sugar dough and top with another circle, pinch the edges to make a seal. Bake at 400°F for 8 to 12 minutes. Variation: Cut dough in large circles. Put filling into center of cut circles and fold over, similar to a turnover, pinch edges to seal (see top photo), and bake as indicated above. I have been searching for this! My grandmother used to make cookies similar to these. She gave me the recipe along with one for her cinnamon rolls. I have it, but I can't find the cookie recipe. I haven't made these yet, but I am sure they will be close to what my grandmother made.